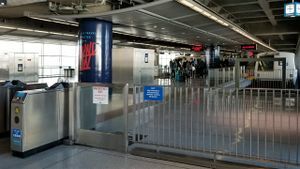 This station is located in SFO's international terminal Gate G. The station is generally within walking distance to the International Terminal and Terminal 3 (United Airlines). To Terminal 1 and 2, take the free AirTrain located above the BART platform. When taking AirTrain to this station from other locations, get off at Garage G/BART Station. This station is served by Antioch - SFO line with direct service to San Francisco and Oakland. Direct service to Millbrae Station (Caltrain connection) from this stop is provided via Millbrae - SFO line during weekday daytime and Sundays and line on weeknights and Saturdays. 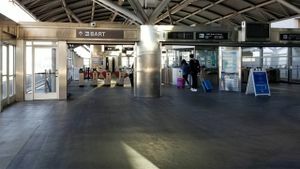 On Sundays, passengers to and from Millbrae need to change between and trains at this station as there is no other lines serving Millbrae on Sundays. Ticket machines for BART are located at the entrance from international terminal and at the AirTrain (SFO) Garage G/BART Station platform. This station features 3 stub end tracks. See overhead electronic sign for boarding location. Because this is a stub-end station, line trains serving Millbrae (nights and Saturdays) basically have to "back out" to continue the trip. (night/Saturday), (weekday daytime/Sunday) to Millbrae. Buses stop on level 1 (lowest level) at Terminal G, two levels below BART. This page was last edited on 22 February 2019, at 13:43.